It seems entirely reasonable to look at the career of Captain Beefheart as a microcosm of the entire counter-cultural movement of the 1960s and 70s. His earliest stuff was warped blues rock, sometimes a little psychedelic and sometimes loose and jammy. There seemed to be a genuine belief that the music was commercial enough without overtly trying to be. In other words, it presupposed a market for rock music that openly drew from Afro-American blues without being a part of that tradition. This was right after the formal, legal end of the Jim Crow era. By the end of the 60s, though, The Captain released Trout Mask Replica, which was probably the furthest “out” version of what the entire hippie counterculture was about, moving from blues rock into free jazz and abstract non-sequitur. Into the early 1970s, the abstraction was scaled back, or at least positioned alongside more radio-friendly material. The Spotlight Kid made overt attempts to hold the weirdness in check and slow everything down. Clear Spot went so far as to include a soul ballad “Too Much Time” along with stuff that still recalled the late 60s weirdness. Whether all this was a naive assumption that the counterculture could survive in that rarefied environment, or just a calculated attempt to make some accommodations (with or without sacrificing integrity) is for the listener to decide. Nonetheless, the early 70s still found The Captain succeeding artistically, even as by the mid-70s he seemed adrift — just like the counterculture that rolled back against the backlash of the business class. 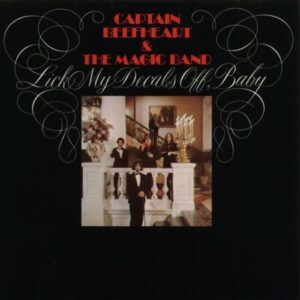 But unlike many of his contemporaries, who never returned to any kind of relevance, Captain Beefheart made some interesting turns in the late 1970s. Shiny Beast (Bat Chain Puller) was a surprising triumph, blending a kind of postmodern panoply of styles that was professionally slick and in touch with contemporary tastes while still remaining inimitably, unwaveringly weird. It was goofy without sacrificing real wit. From there, Doc at the Radar Station accentuated the cerebral, more abstract elements of the music. It accepted a more limited role for this music (even if The Captain was still appearing on national TV to promote the album). His final album, Ice Cream for Crow, confirmed a role of elder statesman of a kind of music that was obviously losing ground and no longer economically viable even at the fringes. But there was still some small space to make the music and Captain Beefheart went ahead and did just that. It was no surprise that the last few albums came along roughly during the punk era. The Captain was fueled by the same independent ethos, even if his music bore little or no direct sonic resemblance to punk. Lick My Decals Off, Baby had obvious parallels with Trout Mask Replica, but it also was more streamlined and decisive. This was music made by a band that knew precisely what it was doing. The fact that wide swaths of the general population wanted no part of it was beside the point. The album was the band’s highest charting album in the UK. While, from a certain perspective, this might be seen as the pinnacle of Beefheart’s Magic Band, and the counterculture as a whole, it also wasn’t enough. John “Drumbo” French‘s memoir Beefheart: Through the Eyes of Magic later indicated that the band was surviving on welfare and allowances from parents. Hardly a recipe for the lasting victory of the counter-culture. Nearly fifty years later, this album sounds remarkable for what it saw as possible — the way the album could demand so much concentration from listeners, the way it could afford to revisit a style that was so commercially unpopular on the last album, the obvious aspirations and ambition directed in such a freaky and non-corporate direction, the role of horns and guitars, and the range of material that could cohesively exist on a single album. Looking back, it is quite a shame that everything this album represented failed to carry the day. But this music survives, and there is still time.